This is the second Preeti Shenoy book that I have read after ‘The One You Cannot Have’, and while both these stories are very different from each other, my overall experience remains the same. This one too started out as total page turner, and this one too has a rushed and unsatisfactory concluding sequence. 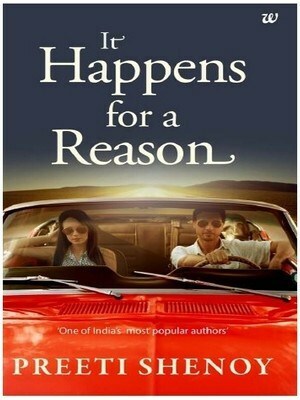 ‘It Happens for a Reason’ is a cross between romance, drama and everyday fiction. The plot revolves around Vipasha (Vee), a girl who gets pregnant at the age of 18, and decides to keep the child, in-spite of being at the peak of her modelling career, and the opposition from her family and even the father of her child. The story opens with Vee giving birth to her child, jumps to present day (15 years later) for some time, and then goes into flashback, which I feel was a little stretched out. But then I am the kind who doesn’t like an extremely detailed backstory when I know how things have turned out. That is just me. Once we are done with the flashback, the story takes a leap forward again to present day, where Vee is a single mom to her son, and has got not one, but 2 unusual jobs. She owns and runs Paw-Factor, a dog boarding facility from her house, and also works as a part time gym instructor. All is well in her world until the day there is an unexpected tragedy at Paw-Factor. And while she is just getting things back under control, Ankush, the father of her child, and the love of her life arrives back on the scene. While Ankush’s return might sound very exciting, this was the point where the book started to go downhill for me. There are a few reasons for this. Just before Ankush was back on the radar, Vee was developing a fondness for Saurabh, the vet who treated the dogs at Paw-Factor. There was potential for playing out this triangle, but instead Saurabh’s character was wasted as he was dropped almost as soon as he even registered. It made me question why was he even there in the story. To make for an interesting blurb? However, the thing that bothered me the most, was how the “grand” proposal was handled. The climax is normally the best and most gratifying part of reading a romance, and to say that I was disappointed, is putting it mildly. The proposal seemed like an afterthought, and there was no formal acceptance. It seemed to be more of a spur-of-the-moment thing, which is so not done. Asking someone to marry you should have deeper thought and stronger feelings involved. At-least that is how I feel about the subject. I must also mention here, that towards the end Preeti did point to the fact that Vee planned on confessing her feelings to Ankush, but that shouldn’t have been left to the reader’s imagination, especially when every other part of the story was told in such detail – why rush the gratifying concluding sequence? Make no mistake, Preeti is an extremely gifted story teller. She is amazingly insightful when it comes to love and relationships, and it shows in the stories that she writes. Preeti’s style of writing keeps a reader hooked, and I love the *realness* of her characters. They are not picked from fantasy land. They are you and me, and people we know and can relate to. This is where Preeti’s strength lies- in creating characters and situations that resonate with the youth of today. And this is why it is all the more disappointing to see a rushed conclusion for an otherwise interesting storyline and engaging narration. All in all, I enjoyed this book up until the very final chapters, and then it was kind of a letdown. Having said that, if you are someone for whom the journey is more important than the way the conclusion is handled, you might like this one. This review has taken a long time coming, mainly because I don’t like to write my opinion (especially a negative one) about a book without being able to articulate my reason, and even then I find it unpleasant to write negative observations. This is why I had considered not reviewing this book at all, especially because I really do enjoy this author’s story telling. But it did not sit well with me to only write about the books that I loved, and leave out the ones I had an issue with. It just did not seem fair or right. So here I am. Have you read this book? Do you feel the same way about the ending sequence? Please feel free to share even if you have a contradictory opinion, as I am open to listening to a different perspective on how the conclusion was handled. Appreciate an honest review with reasons for your observations. am so impressed with your reviewing skills. 5/5 for that! Seems like a balanced review Shantala. I know how hard it is to give a negative opinion, specially if you know the person as more than an author. Oh and I too like a book with a solid ending. I hate it when I’m left hanging. You have got an honest review there and it is important to share exactly what you feel. I have not read any of Preeti’s books but I have heard readers raving about this book. So, your review seems fair depending on what you prefer to read. Honest review for sure. I’m glad you did write it finally. I have read her first book – 34 Bubblegums and Candies. Seemed like a collection of blog posts. Most were good. You’re right… she does know how to tell a story. Kaddu recently posted…What’s Worse: No Net or Slow Net? I love honest reviews as a reader. Not sure how I’ll react as a writer ?. That being said, I’ve heard a lot about this author but I’m not a big love story fan. So I may not pick up the book. I know what you mean. It is pretty much the reason why this took a long time coming. This is the first book I have read from Preeti Shenoy and I agree with all your observations Shanaya, you have got the reader’s pulse bang on. I have read her 2 books : Life is what you make it and Tea for two and a piece of cake. I like her writing style and stories that are relatable. Liked your review of her new book. Books with hastily written ends are a bit of a dampener! Yes, she does write well, very well in fact. That is why it is kind of disappointing to see a rushed end. Introduced to your blog by a friend. Lot more reading for me to do ? This is an honest review. I have read two of Preeti’s books not this one though. I feel the plots are oversimplified and the previous boom left me a bit disappointed for being too predictable. I guess I won’t be picking up another book of hers soon. 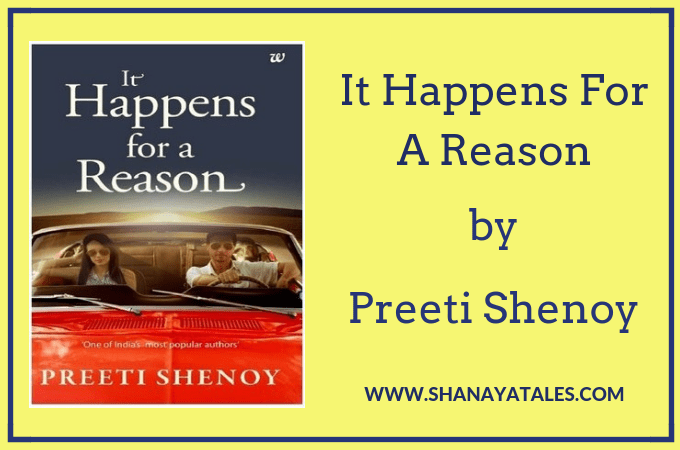 “it happens for reason” really very nice story written by Preeti….this one is first book which i read of Preeti ,now i want to read further books of her. i think there is also reason why i read this one. Need to send an author’s new bok launch news. Please share with us your email id and number for the same.